For nearly 15 years, Dry Mixed Recycling (DMR) has been a standard waste stream within the waste industry. Initially introduced as a way to reduce contamination, the DMR waste stream aimed to improve the quality of recyclable materials and improve landfill diversion rates. A DMR service has also been a benefit for waste producers as it provided some cost-relief from the price of general waste, which is at a higher price point due to factors such as landfill tax and the heavier weight of the containers. However, the DMR waste stream isn’t without its flaws and as new developments and changes impact our industry, the issues of a mixed stream for recyclates are being exposed. What does the industry require from recyclate materials? High quality has always been a requirement for recycling processors and the waste industry is fully-focused on how to better increase the quality of our recyclates. Entering full force in March 2018 – China introduced new restrictions on imports that impacted the entire waste sector and the recycling market. The restrictions included a 0.5% contamination limit on recyclates, in addition to a ban on plastic and mixed paper waste entirely. In the aftermath of the China import ban, the focus on imports shifted to other countries, with Malaysia, Turkey, Taiwan and Thailand, in particular, seeing a growth in the materials imported. In a comparison of plastic waste published in the FT Weekend article Recycling is Broken, Can We Fix It? 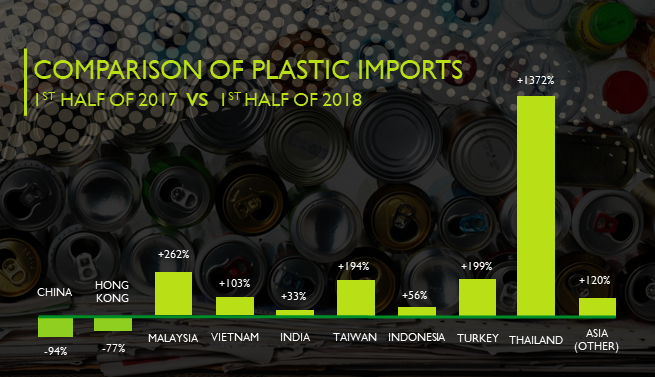 for the 1st half of both 2017 and 2018, China’s plastic imports dropped by 94% and as a result other imports have seen a significant rise in plastic imports, Thailand especially seeing a rise of over 1300%. What does this mean for our recyclable materials? The focus needs to be on quality, quality, quality. For the UK to reach our recycling targets, improve landfill diversion rates and to ensure we are meeting the market standards for recyclate buyers, the quality of our recyclates must improve. This statement was previously made by the Recycling Association in 2016, when they warned that “UK reprocessors must address quality or risk buyers looking elsewhere.” Now, the quality requirement is even more paramount for the UK, and DMR is in the firing lines as one of the main causes of low-quality recyclates. With the need for higher-quality materials increasing, the pitfalls of DMR as a waste stream are more exposed than ever before. The two major pitfalls that could contribute to the DMR era coming to an end are the contamination/poor quality of DMR loads and also the existing need for segregation. The definition of DMR varies for each waste company. Whilst materials such as paper, card, plastic and metal are common inclusions, there is no grade definition or quality control applied to DMR as an industry standard. A constant cause of contention for waste companies – DMR services are also riddled with contamination problems. When DMR loads are contaminated by other waste streams, it impacts both the costs for the waste producer and also the recovery value of recyclates. We believe that the root cause of DMR contamination is a lack of understanding of what materials actually qualify as DMR. Whilst most waste companies have been tackling the issue for years, with the use of training, education posters and signage, contamination is still an ongoing issue. When dealing with single waste streams, the differentiation is much more clear-cut whereas having a mixed stream for recyclates, this can lead to more confusion on what does/doesn’t count as DMR. In many cases, DMR waste loads can become too contaminated to be fully recycled. In situations like this, the waste is typically classed as a ‘light waste’ or just general waste. Then rather than being recycled, the materials are sent on for energy recovery or, worst case, landfill disposal. One of the biggest selling points of DMR to waste producers is that they’re not required to segregate individual waste streams to ensure their materials are recycled. Having one waste stream for all recyclates instead gave waste companies the responsibility of segregating materials via Materials Recycling Facilities (MRFs). However, whilst a DMR bin was originally a cheaper alternative to general waste, there are still additional costs involved to cover the processing of the waste materials. Over time, costs for DMR services have risen due to the contamination issues and the required processing of DMR and these prices risk rising more so over time. In addition, with the contamination and quality issues that arise from DMR loads, the recovered materials from MRF’s are often not at a high-enough quality for recycling processors and are instead classified as ‘light loads’ or just general waste, and this increases the charge for waste processors. In a way, this negates the idea of segregating DMR from general waste, which is a huge step back for the waste industry, and ultimately makes us question whether DMR really is a sustainable solution for the future. The way we see it, in order to adapt to industry demands, there are a number of potential changes that could be in store for the future of DMR. However, as with all changes, there are pros and cons to each and with so many variations to consider – scale of waste producers, education and mindsets of producers, costs and practicality for producers and waste companies alike – it would be difficult to find a single solution that would work across the board. With this in mind, here are some of the ways we think DMR could change and what positive/negative impacts could be involved in these changes. For DMR to remain a viable solution for the recovery of high-quality recyclates, more restrictions could be applied to recyclates that are currently classed as DMR. By creating more exclusivity for higher grade recyclates, this will increase the value of the materials. This, however, could become difficult for waste companies to manage/police and also be confusing for waste producers to understand. This confusion would likely lead to contamination, which is already a prominent issue with current DMR services. Single waste streams are becoming more appealing to commercial and industrial business that want to improve recycling rates and costs. We have seen many of our own larger customers move away from DMR in favour of segregated recyclates. However, whilst single waste stream collections would have an appeal with large-scale waste producers, it wouldn’t necessarily be ideal for SME’s and companies that produce a lower-quantity of each recyclate waste stream, because of the increase in waste containers, services and costs involved with single waste stream services. Following the notion of the TEEP Regulation that came into effect in 2015, which required producers to segregate waste only when it is Technical, Economical and Environmentally Practical to do so, now more than ever it would be beneficial to consider how we can make single waste streams a practical concept for SME’s. This may also change again as the government considers removing ‘Economical’ from the TEEP Regulation. Whilst it’s positive to see the government taking into consideration the need to segregate waste and improve the quality of recyclates, the change has been deemed controversial as it would no-doubt force many waste producers to adopt waste segregation despite it being cost-ineffective. As we mentioned earlier in the pitfalls of DMR, the cost of DMR services has already been increasing in the industry, to cover processing costs and low-recyclate values. Over time, the contamination and low-recovery rates of DMR will continue to increase the cost until it is at a similar price point to general waste. The lower price is arguably one of the biggest appeals for DMR services – it encourages waste producers to segregate their waste for better recovery rates. Without the incentive of cost saving and reducing recyclate rates, this could see many waste producers retreating to just having one service for general waste. This would be a huge step back for the UK and would ultimately have a knock-on effect for our recycling rates, with more recyclates being unrecovered and sent to Energy from Waste facilities and landfill sites as a consequence. A middle ground between DMR and single waste streams would be to introduce simpler co-mingled waste streams that, whilst not as effective as single waste streams, would be an effective step up from the “everything but the kitchen sink” approach that is DMR. In fact, we have already begun adopting this strategy here at JWS, by working with some customers to segregate their recyclates into three distinct waste streams: Paper & Cardboard, Plastic Bottles & Cans and Glass. In our opinion, changes to current DMR services are a must if the UK wants to increase the quality of our recyclates and ensure we improve our recycling rates. However, DMR services have been a staple in the waste industry for many years and adapting (or removing) this service will be a monumental change to commercial waste services. 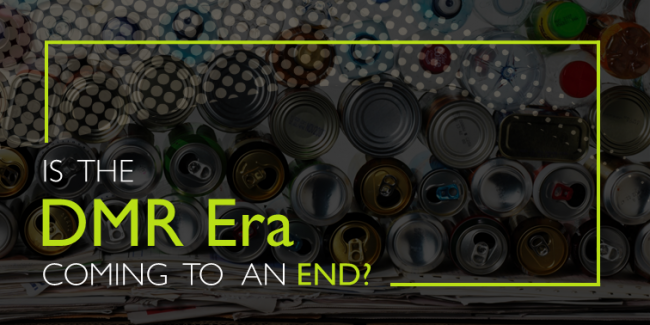 Change is never easy, but with the future of DMR hanging in the balance, it’s clear that current DMR services cannot continue as they are with the current recycling market demands.